Coca-Cola is one of the most iconic brands of both the 20th and 21st centuries, promoting itself as the drink of freedom, choice and US patriotism. 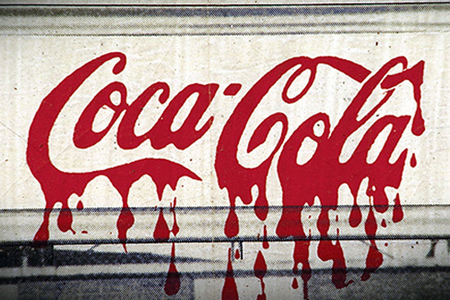 Below you will find two documentaries about the dark side of Coca Cola, and a short video by Mark Thomas who talks about his book exposing Coca-Cola called, 'Belching Out The Devil'. [Above documentary] Political activist and journalist Mark Thomas travels to South America, India and the US to investigate the way in which Coca-Cola and its suppliers operate and the extent to which they upholds moral and ethical obligations. Thomas, a long-term critic of Coca-Cola's more controversial practices, finds disturbing evidence which undermines its effervescent image as a force for good and which has prompted a global consumer backlash. (Further information). 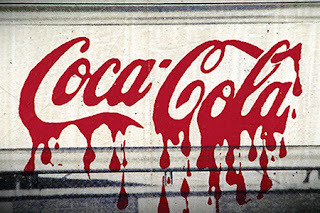 [Avove documentary] Coca Cola, we’ve found out, has actually been cooperating with paramilitaries in Colombia to execute workers in their own bottling plants that are trying to form unions and trying to demand better working conditions. So we’ve been able to bring this to the attention of Universities and say ‘if Coca Cola doesn’t stop doing this and if Coca Cola doesn’t adopt different practices, then our University is no longer willing to have anything to do with Coca Cola.